Ever wanted to drive a death-proof tank into the middle of a tornado and film the whole thing from behind a layer of safety glass? That's just what happens in forthcoming IMAX extravaganza Tornado Alley, filmed mostly in Kansas during storm season. Now you can see it in eye-peeling IMAX in New York's American Museum of Natural History, for free, this Wednesday. The screening will be held this Wednesday, March 16 at 6:00pm at the American Museum of Natural History, in New York City, and filmmaker Sean Casey (Discovery's "Storm Chasers") will be there too. Entrance for the event will be at the 77th street entrance, between Central Park West and Columbus Ave. Guests, including children, are welcome. And io9 readers can get in for free by writing to tornadoalleyamnh@gmail.com – just include full names and how many guests there will be. 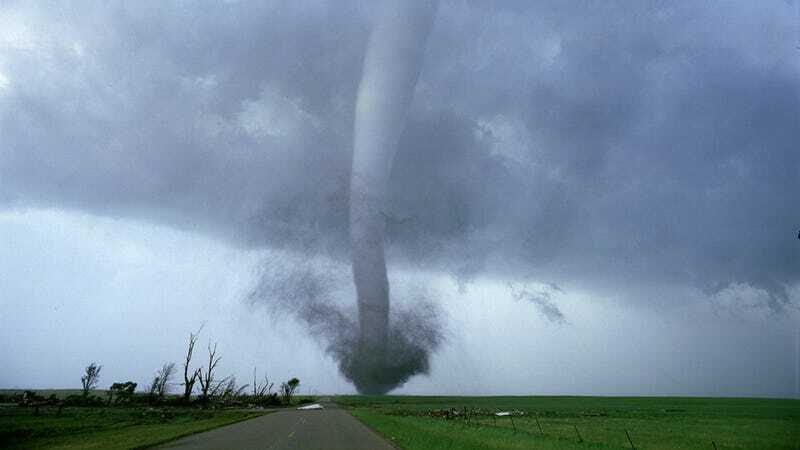 Narrated by Bill Paxton ("Twister"), Tornado Alley chronicles Sean Casey's unprecedented eight-year mission to take audiences inside of one of Earth's most awe-inspiring, terrifying, and mysterious events - inside an actual tornado. Armed with a 70mm camera, a fleet of customized vehicles designed to withstand gale force winds (including the revolutionary "Tornado Intercept Vehicle") and an arsenal of the most advanced weather measurement instruments ever created, Sean Casey and the Tornado Researchers of Vortex 2 risk their lives to take audiences on a thrilling quest to witness, for the first time ever, a tornado's destructive power at pointblank range. Tornado Alley will be coming to a museum near you soon! A scary cloud over a Kansas home.